Angeliki Gazi is a psychologist,with a Bachelor’s degree from the University of Ioannina. She holds a Master’s Degree and PhD on Media Psychology, on the subject of radio and Identity, from the Department of Communication and Media Studies, University of Athens. 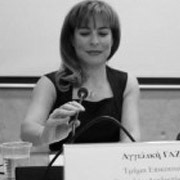 Her clinical training concerned group analysis.She has taught Psychology and Media at University of Athens, University of Peloponnese and National Centre for Public Administration and Local Government, Ministry of Interior, Decentralization, and E- government, Athens. She has published articles in refereed international journals and two books and she participated in international conferences.She is a reviewer in two International Journals, a member of the International Editorial Board of the “Journal of Radio and Audio Media”, Broadcast Research Association, Routledge ed. and a member of the International Editorial Board of “The Radio Journal”, Intellect Ltd., UK.She is a founding member and former Vice Chair of the Radio Research Section of European Communication Research and Education Association (ECREA),a member of Scientific Committee of Groupe de Recherches et d’ Etudes sur la Radio (GRER), a member of Hellenic Psychological Association and founding member and co-chair of the Division: Media Psychology and Technology, Hellenic Psychological Association.